Home News He Couldn't Hand Out The Constitution. Now He's Suing. He Couldn't Hand Out The Constitution. Now He's Suing. 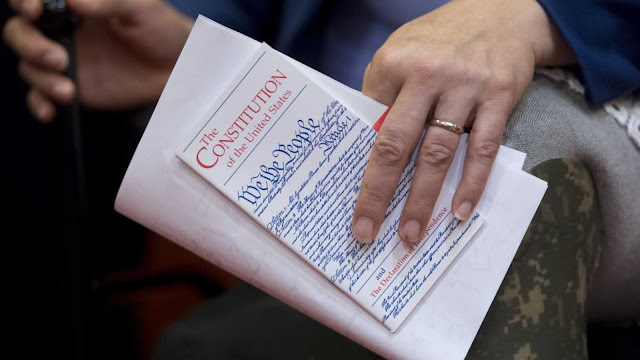 A student whose college refused to allow him to hand out the U.S. Constitution is continuing his legal battle with the school. Kevin Shaw filed a lawsuit against Los Angeles Pierce College in March 2017, which survived a motion to dismiss from the community college earlier this year, and is now in the discovery phase, according to The College Fix. The Foundation for Individual Rights in Education (FIRE) assisted with the lawsuit. Shaw had attempted to hand out Spanish-language versions of the Constitution in order to recruit new members for the right-leaning student group Young Americans for Liberty. He was told he could not hand out the documents unless he was in the school’s free speech zone, and only with a permit. He says they also threatened to remove him from campus if he refused to comply. Pierce College had a tiny free speech zone, which equated to the size of an iPhone on a tennis court, according to FIRE’s calculations. Shaw’s lawsuit received a Statement of Interest from the Justice Department last fall, and Attorney General Jeff Sessions mentioned the suit at Turning Point USA’s high school leadership summit in D.C. on July 24, 2018. "Last March a student filed suit against Los Angeles Pierce College, alleging that it prohibited him from distributing copies of the Constitution outside of the designated 'free speech zone,'" Sessions said. "How big was this free speech zone? 616 square feet — barely the size of a couple of college dorm rooms. Outside of that space, students did not have freedom of speech. The student sued and we stepped in on his behalf in the case." Shaw’s attorneys hope that Pierce College will change its policies regarding free speech.